We know from our customers that price is not the deciding factor when moving IT services to the cloud. Most customers see significant savings (as much as 70%) when they adopt cloud-based solutions. A business shouldn't think of its IT and communications services like a commodity as these are the systems they rely on every minute of every day. Businesses need expert 24/7 technical support that offers the ability to reach a live person in less than one minute, highly reliable and secure services, back-ups, mobility, control over their environment, and more. All of which Nero Consulting provides. Does price matter? Sure. However, smart businesses recognize premium products and business-critical services and are willing to pay for the necessary value they provide. They see IT as an investment that pays dividends in more productivity, efficiency and business growth. As the market for cloud services continues to grow rapidly, we understand that the competition is becoming fierce. With that said, Nero Consulting’s cloud services and super infrastructure for Backup, Protection and Communications makes an unbeatable offering. 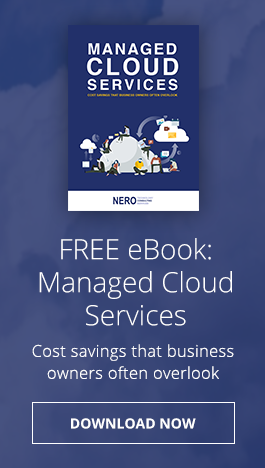 Call us today to learn how a Nero Consulting cloud solution can pay dividends for your business.